Symmetra’s Qualifying Matches is a silly, riotously funny and irreverent fan game in which the player is Symmetra, a self-serious photon-bender who, here, is the object of her Overwatch teammates’ flirtation. Symmetra navigates conversations with heroes like Pharah, Sombra and Junkrat, some of whom are putting the moves on her. And occasionally, she does the whole Overwatch fighting thing. All of this takes place through wittily written descriptions of Symmetra and her Overwatch colleagues’ actions. Sometimes, the player has some options for what Symmetra should do, which shape the game’s narrative. 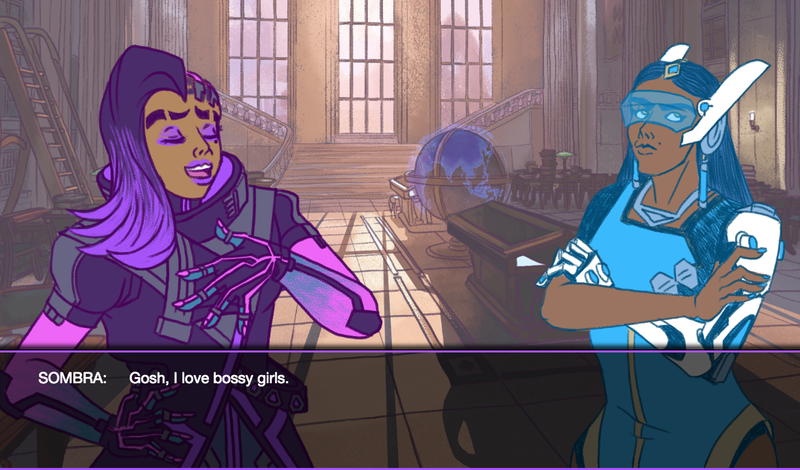 In between her dating and payload-escorting duties, Symmetra ends up in very ridiculous conversations with heroes like Genji and Mercy (who, in this game, are dating) or Mei and Zarya (also dating). She has ten days, and ten matches, to find love or not. Symmetra’s Qualifying Matches is free on Itch.io and recommended for anyone who ships, well, anyone in Overwatch.